This exhibition presents paintings, drawings, sketchbooks, and 3-D models by Don ZanFagna that explicate the futuristic and metaphoric concept of “growing” your own house. Conceived in the 1970s, he imagined a home created, constructed, and maintained by all-organic processes and in perfect harmony with nature. ZanFagna is an artist, architect, and designer whose lifework not only defies established categories but challenges rote notions of the role of the artist in society. The advent of this exhibition has uncovered a vast trove of related writings, drawings, photographs, artworks, collages, models, and ephemera that the artist created over his long work life. ZanFagna traveled the world researching standing stones, Mayan ziggurats, and various ecological systems, always in pursuit of underlying intrinsic structural concepts that might be adapted by humans to create habitats informed by these “invisible” or unknown processes. He pored over books, manuscripts, proceedings of conferences, and investigations detailed by Nature, NASA, and the popular press as he sought to uncover anything that might illuminate some aspect of his quarry on the art-human-ecology-technology continuum. ZanFagna proved to be a restless innovator and inventor. His notebooks, journals, and early works overflow with remarkably prescient descriptions of such things as the development of the personal computer and the Kindle—“all the world’s books in the palm of your hand”—and were included in an exhibition at the Whitney Museum of American Art, in 1971. He also anticipated large-scale use of solar panel technologies and the use of biological processes, algae and ethanol, to generate energy. Through a remarkable journey of discovery, chronicled in dozens of densely illustrated and annotated sketchbooks, Don ZanFagna became obsessed with the idea of designing a form of sustainable architecture that was in harmony with natural processes—a structure he called the Pulse Dome. From roughly1971 through 1995, he researched world indigenous structures,insect architecture, wombs, and such natural forms as caves,tunnels, and volcanoes to learn what had been done already and what was still likely to be accomplished by others in relation to sustainable human architecture. Among other lines of inquiry, he explored Palladio’s notebooks, an amalgam of many other architects’ notes, to try to unlock the secrets of the Egyptians’ sacred geometric harmonies. Deeply influenced by the writings and activities of Buckminster Fuller, ZanFagna was captivated by Fuller’s geodesic dome. Drawn more to the underlying physics and mathematics behind the tensile strength of the dome itself, ZanFagna began an earnest investigation into other ways in which these archetypal geometries are revealed and might be put to use. Much of the work in another of his series, “21st Century,” involved detailed pen and ink studies and three-dimensional tetrahedral models that explore the correspondence between geometric structure and nature’s symmetry. In the 1970s, a counterculture ethos was sweeping the country, as many other designers and architects took up projects similar to Pulse Dome. What sets ZanFagna’s ideas apart is that he was just as interested in posing the difficult questions to the field as he was in providing solutions. In this sense, his provocations became something of an irritant—in the same way a grain of sand in an oyster creates a pearl—and laid the groundwork for his future. He saw simultaneously, the metaphoric, historic, biologic representation of an image/idea. An example of this is what he called “the dome of psychic resonance—a diagrammatic architecture” that supposes the intriguing idea that one’s own breathing might be part of the generating process to “grow your own house.” ZanFagna is a provocateur, yet his considerable plans, models, and prototypes derive from a rigorous, disciplined scholarship. The Pulse Dome Project was a cry in the dark, a proclamation to all people, especially those charged with shaping our built environment, to grasp the reality that our current system is at odds with nature—and therefore unsustainable. While this position is the accepted orthodoxy today, at the time ZanFagna was making these statements he was not following a trend, he was helping to establish one. The Pulse Dome Project remains as a testament to one man’s attempt to apprehend a comprehensive solution to one of humanity’s most vexing problems—sustainable shelter. The exhibition and publication Pulse Dome Project: Art & Design by Don ZanFagna has been made possible by generous grants from the Graham Foundation for Advanced Studies in the Fine Arts and The Bishop Family Foundation. Guests will enjoy live music by Illuminations Trio, featuring musicians Ron Wiltrout, Bill Carson and Sam Sfirri. Complimentary refreshments and light hors d’oeuvres will be provided by Whole Foods. The Pulse of Charleston panel discussion will feature local architects and preservationists. How are Don ZanFagna’s theories reflected in Charleston? One can argue that historic buildings and their preservation embodies the concepts that he was trying to promote – perhaps in surprising ways. Panelists include Mark Sloan, Winslow Hastie, Reggie Gibson and Whitney Powers. Reception to follow. Co-sponsored by Historic Charleston Foundation. The Bio-Logical Architecture: Past, Present, and Future symposium will will bring Linda Weintraub, an eco-art-architecture writer, and William Katavolos, an architect and designer, together with the Halsey Institute’s curator Mark Sloan to discuss eco-bio-architecture. Panelists will examine many topics relevant to the subject, including liquid architecture, and the ways in which some of ZanFagna’s seemingly far-fetched ideas have become a reality. The symposium will take place in the Recital Hall, Simons Center for the Arts, 54 St. Philip Street. Reception to follow in the Halsey Institute galleries. The event is co-sponsored with the College of Charleston’s First Year Experience program. Born in Saunderstown, Rhode Island, in 1929, Don ZanFagna has a degree in art, architecture, and design from the University of Michigan and a MFA in painting from the University of Southern California. During the Korean War, he served as a fighter pilot. Following his discharge, he received a Fulbright/Italian Government Grant for study in Italy, in 1956–57. In the late 1960s, after relocating from California to New York, ZanFagna chose to remove himself from the commercial art world. He was more interested in the research and process of his art than its promotion or sale. In the 1970s and ‘80s, he was the chair of the art department at Rutgers University. The following decade, he was Visiting Eco-Architecture Professor at Pratt Institute. Now in his eighties, ZanFagna, with Joyce, his wife of fifty-five years, has retired near Charleston, South Carolina. 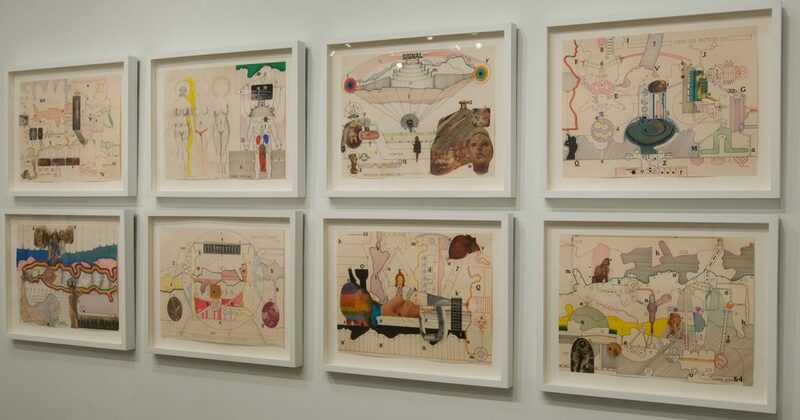 Don ZanFagna’s notebooks provide an intimate look into the artist’s mind. Because the notebooks are somewhat fragile, they could not be handled by the general public. Instead, we commissioned videographers Christopher Hanson and Aaron Neu to provide a “fly-through” of ZanFagna’s notebooks in the form of a video. An original musical score by Bill Carson accompanies the visuals. Following ZanFagna’s lead, Bill Carson did research into the Mesoamerican (Mayan) calendar system. He based his musical compositions on the overlapping cycles contained within this calendric system (embedding a 20 note melody over a 13 beat bass line, for example). The result is, predictably, hypnotic. The Halsey Institute has commissioned Clemson Architecture Center in Charleston to create a structure inspired by Don ZanFagna’s forward-thinking concepts of architecture and materials. The architecture students in Studio V, led professor by David Pastre, are working on a semester-long project researching Don ZanFagna and his dream domes, along with other 70s era eco-pioneers. How the students interpret the material will be unveiled on Saturday, December 8 after the closing symposium. This will mark the Halsey Institute’s sixth collaboration with Clemson’s Architecture program. The Pulse of Charleston panel discussion will feature local architects and preservationists. How are Don ZanFagna’s theories reflected in Charleston? One can argue that historic buildings and their preservation embodies the concepts that he was trying to promote – perhaps in surprising ways. The discussion will take place at in the Halsey Institute’s galleries and attendees will be surrounded by the work of Don ZanFagna. The exhibition will open at 5:30pm and the panel will begin at 6:00pm. Panelists include Mark Sloan, Director and Senior Curator of the Halsey Institute; Winslow Hastie, Chief Preservation Officer for Historic Charleston Foundation; Reggie Gibson, architect with Gibson Guess Architects and Whitney Powers, President of Studio A. Inc. A reception will follow the discussion. Co-sponsored by Historic Charleston Foundation. A symposium entitled Bio-Logical Architecture: Past, Present, and Future will be presented on the last day of the exhibition, Saturday, December 8. The Halsey Institute will bring Linda Weintraub, an eco-art-architecture writer, and William Katavolos, an architect and designer, together with the Halsey Institute’s curator Mark Sloan to discuss eco-bio-architecture. The speakers will explore the cultural climate of the 1970s and present various competing alternatives to conventional architecture. A reception will follow in the Halsey galleries. The symposium is co-sponsored by the College of Charleston’s First Year Experience program and the Halsey Institute. The symposium will begin at 2:00pm in the Recital Hall in the Simons Center for the Arts at 54 St. Philip Street. The symposium and reception are free and open to the public. 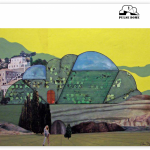 Published by the Halsey Institute of Contemporary Art to accompany the exhibition Pulse Dome Project: Art & Design by Don ZanFagna, the catalogue includes an essay by Mark Sloan, senior curator and director at the Halsey, as well as words by the artist, Don ZanFagna. As a Halsey Institute member, you could receive 20% OFF this publication and all Halsey merchandise! The Halsey Institute of Contemporary Art at the College of Charleston, South Carolina has produced this traveling exhibition and its attendant activities. Funding has been provided by generous grants from the Graham Foundation for Advanced Studies in the Fine Arts and the Bishop Family Foundation.